In "The Dallas Syndrome," (which was blandly renamed "Dallas' New Cultural Buildings" in the web version), the fantastically-named Edwin Heathcote cuts to the chase regarding Dallas' sterilized version of urbanity. The brand new Arts District buildings, he points out, are "an attempt to give the city a soul." 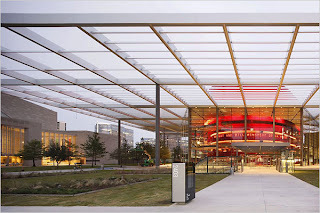 The reviews of the new Wyly Theater and Winspear Opera House fare pretty well here, just as they did in the New York Times review. The real problem, though, is the context of the buildings. The place component. The people component. Confession: Planners like to see ourselves as the "we" against architects' perennial "I." No building exists in a vacuum. No amount of money can make a space work if it's not an organic place where people want to gather (I'm looking at you, Victory Park). A great building within a less-than-great place doesn't make the place great. It makes it a lonely building. 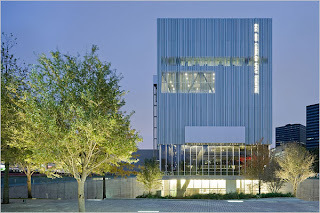 The article opens with Rem Koolhaas, the architect of the brand new Wyly Theater, telling the audience at the ribbon-cutting, "Dallas is the epicentre of the generic." Cue the nervous laughter from the audience. But as our loquacious British narrator explains to us, Koolhaas is right. Although Los Angeles is often dismissed (and misunderstood) by Europhiles as a city with no centre and no heart, Dallas would be a better example. Its central business district is a melange of defunct US tropes: mirror-glazed blank-slab offices, massive multi-storey carparks, conference centres that have the size and aspect of walled cities. But they have their own interest. These are the archetypes of modernity; any visit to the Middle or Far East shows that this is the architecture of today. Koolhaas is right: Dallas, despite its failure as an urban model, remains the exemplar for corporate cities in hot climates.The Arts District is the cultural version of that city. Here star projects sit in self-satisfied isolation, unrelated to each other, unconcerned. Valet parking attendants ensure that patrons arrive and depart without being contaminated by any sense of urban life. The two new buildings try, and broadly fail, to address the problems. Yet they are far from failures in themselves. Heathcote points out that at least with the Opera House, the work was not site-specific. The red-glazed building could have been placed anywhere. Its relationship to the street is designed so that pedestrians can look into the space and feel a part of it. Only in the Arts District, there's no one milling around outside to take a peek. Both the new Dallas buildings function well; they do what was asked of them and provide genuinely world-class facilities by star architects. The problem lies more with the conception of the Arts District. Within minutes of the end of each inaugural performance, the only public animation of the surrounding spaces was a mass of shivering patrons waiting for their cars to be returned. And then nothing. It was all over. If these buildings are supposed to be part of an effort to “regenerate” or “reconnect” the city centre, they have failed. Dallas is indeed special because it is so generic. Both buildings reflect on this. Koolhaas’s is critical and consequently compelling, Foster’s is didactic in its attempts to Europeanise the cultural quarter through an architectural style that is itself massively influenced by US corporate modernism. The Dallas Arts District will never be a part of a conventional city in the European sense: it is closer to the existential isolation of the convention centre or the starchitect-designed airport. It is both unique and unsettling, a glimpse of a future in which architecture and culture are imported to save a city from itself. Make no mistake: I'm glad the Arts District and these new buildings exist; I just see them as the beginning, not the grand finale. What I like most about the challenge facing Dallas is that the glittery buildings are done. The corporate sponsorships are lined up. That is, after all, what Dallas does best: setting its sights on an expensive, magical answer to a problem and lining up the money to pay for it (see: Convention center hotel, Trinity River project). That high-dollar response is the way Dallas has done its business for decades. What needs to come next is filling in the gaps with a variety of small projects. Yet that is also precisely what Dallas does terribly: getting to the heart of the how and why places live or die. It's grungy work: contamination, as Heathcote termed it. It involves people. It involves, uh-oh, planning. It involves interaction. But the dirty work is the lifeblood that can transform a cold rendering into a pumping, beating place. The way out of Dallas' perpetually sterile existence, the way to start building a soul in a city that tries so hard to construct new monuments over the makings of one, is in its people. Great neighborhoods don't have much of anything to do with how shiny their biggest buildings are. Great neighborhoods are about the variety of what's there and how those elements all relate to one another, how people get there and move around within the space, and how they feel doing it. The good news is that there is potential on the horizon: a new pedestrian park that will (finally) cover up part of a terribly placed highway and connect Uptown with Downtown; a modern streetcar that will go places people want to go, in a way they want to get there; more people living downtown all the time. All of these elements could help "dirty up" downtown in exactly the right way. Getting them right is tougher work than writing a check for a new building, but it's the kind of work that Dallas desperately needs to do. It's time to roll up those sleeves and get started. very interesting post. as a person who grew up in the dallas area, i am very proud of what the city has to offer. however, i do have to agree with the fact that there really is no cohesiveness to anything. i never really stopped to think about what takes place in city planning, but am now intrigued. I also find it incredibly odd that we've left so little green space and nature around us that now it seems like the logical next step to build a park over the freeway.